How do I add a new Building Admin to manage this building? If you need to add a new Building Admin to manage this property, click on the Building heading and hit Building Admin. 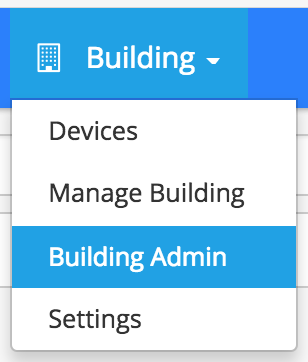 Hit the New Building Admin button. When prompted, enter all required information about the new Building Admin and click the Add button. After clicking add, their account will be created and they will a receive a verification email with instructions to set a password and log in.